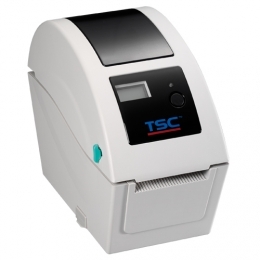 The small direct thermal printer TDP-225 from TSC offers your more space with a mere 109 mm width, it fits into nearly any work space. It will also impress you with its low price tag and printing properties. It clearly and reliably prints onto media up to 60 mm wide at 8 dots/mm 203 dpi. The medium format predestines the desktop printer for shelf labeling, inventory management, shipping labels for low volume mailing series and many additional applications. Prints labels for inventory management, shelf labeling, addresses, etc. Max. medium width 60 mm max. print speed 127 mm/sec. The user-friendly double-walled clamshell design simplifies media changes and ensures for a smooth run. You only need to open the cover and place the labels into the centrally located spring-loaded material tray. An optional LCD display gives you additional status reports about the current print job. Because of its standard integrated industrial emulations such as EPL and ZPL the TDP-225 is compatible with nearly any other printer. Connect it via USB or optional Ethernet interface easily into the existing environment. With the optional keyboard, the TDP-225 also operates in stand-alone mode.